I originally wanted to buy Giant’s new Quick-e electric bicycle. I went to Giants website to search for dealerships in the US that stocked a Quick-e bicycle with an extra large frame. The website said there were only two dealerships in the USA, and both were to far away to drive to. I decided to call the dealerships and see if they are willing to ship the bicycle. The first dealership said “no, we can’t ship because the bike uses a lithium battery.” I never understood that one because there are so many sellers on ebay and Amazon selling electric bicycles and electric bicycle kits with lithium batteries that are shipped to you. I called the next and last dealership and they said all their XL Giant Quick-e electric bicycles were turned into rentals. I than tried to contact Giant bicycles directly through their website to see if they had a solution, but I never got a reply back. I guess they want retail customers to use their dealerships to answer questions and solve problems. 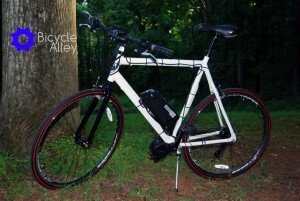 So, after all this I decided to build my own electric bicycle and boy am I glad I did, I saved $2000. I remembered watching a video on YouTube about a GMC Denali bicycle available in larger size’s for tall riders, so this is the bicycle I purchased to install an electric bicycle kit. I bought a Bafang BBS02 750W mid-drive motor with a 48 volt 11 Ah lithium-ion battery from a seller on ebay. 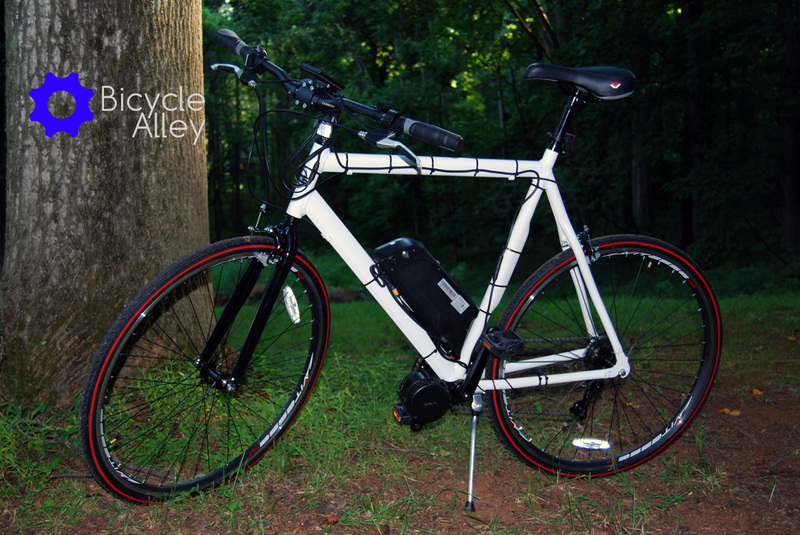 The Bafang electric motor kit with the battery was $799.00, and the 25 inch GMC Denali bicycle was $168 plus tax. I also had to replace the stock Denali drop down bars with mountain bike bars. The electric kit comes with brake levers with a cut-off switch for the electric motor, and the brake levers will not work on drop down bars. The installation took a little longer than I expected because I ran into some unexpected problems, which you can see in the video below. I would say the installation took around 3 hours, and I could probably cut that time in half if I did the installation again. After I got the electric motor kit installed and everything working, I installed some accessories. The first accessory was a set of Planet Bike 35mm front and back plastic fenders. This was also a difficult install because road bicycles don’t have much room for a fender between the rear tire and frame, and front tire and fork. To make room, I had to cut a piece out of both the front and back fenders to make room for the tire when it rotates. With this solution the largest tire I can use is a 700 x 32. Anything larger and the tire will rub against the fender. The bicycle frame, forks and brakes cover up the cuts I made in the fenders, so they are hidden from view. I am happy with the fenders and I can always take them off if I want to use a larger tire. The next accessory was a Topeak rear rack. I won’t say this was difficult to install, but the bicycle does not come with any threaded braze-ons on the seat stay to attach a rack. I had to buy a pipe clamp at Home Depot to attach the rack to the frame seat stay. Most bicycles have two seat stays running from the rear drop outs to the frame seat tube. The GMC Denali also has two seat stays starting at the rear drop outs, but they combine into one larger tube about 6 or 8 inches from the seat tube. The single tube is about 1 inch in diameter. I used the clamp to clamp around the single seat stay tube. I cut up a used motorcycle tube and covered it with one strip of white Gorilla tape and wrapped that around the frame to protect the bicycle frame. I also painted the pipe clamp black to match the rear rack. Its a clean solution and works well. The next thing I did was replace the tires. I didn’t like the rolling resistance of the stock tires or their puncture resistance, so I replaced them with Schwalbe Marathon Plus tires. They are excellent tires! I have to say I am very happy with the bicycle. Before the accessories it cost less than $1000, which is 1/3 the price for a Giant Quick-e bicycle, so I saved a lot of dough. Its a feature rich electric bicycle with up to 9 petal assist levels and a thumb throttle. It has a very nice colored LCD display. I figure if a person was to switch from using the bus to riding this bicycle to and from work, they would save approximately $1.75 per bus trip or $3.50 per day in bus fees. It would take a little over 14 months for the bicycle to pay for itself. The only question mark I have is the reliability of the Bafang electric motor, but it seems like a solid motor. I will continue to do regular updates on the bicycle.